If you wish to contact the editor and don't have email access, FOLLOW THIS LINK to an on-line messenger. Complete contact information available AT THIS LINK. St. Marys High School is hosting Ravenswood High School on Thursday, December 5th at 6pm for a dual meet. Both schools will be including our middle school programs as well. We would like to open the match up to 1-2 more teams (preferably that can bring middle schools as well). Please contact Head Coach Jay D. Smith at 304-966-6577 or jay.d.smith@k12.wv.us. Philip Barbour will be holding a tournament next December 6-7. The format will be individual pools. We have space reserved for up to eight mats in two gyms. For more information e-mail Coach Pete Ferguson at peteferguson@yahoo.com. Varsity pool tournament, We will place JV wrestlers if needed to fill pools. Format 16-24 teams split into pools. Contact Coach McDonough if you are interested in attending. Next event: The team finished 4-9 in duals this season and will be graduating five seniors. Time to add Girls Wrestling? "Don't Even Bother Showing Up"
Detail for Rick Link Invitational December 7, Union Local HS, Grafton Duals December 28. High School Academic All State and Academic Honor Roll updated. Middle School Academic All State and Honor Roll updated. See also 2014 Winners Choice video. Spots open for Barnesville Doan Ford Invitational December 13-14, 2019. Attention WV Middle School Coaches: Vote in the final Middle School team poll. Vote by 6PM Wednesday February 27. MS coaches can vote in the "Middle School Coaches Only" area of the forum. You need a coach username/password to get in to this area of the forum. If you need a username/password to get in to this area, send email to tmiller@mountain.net and we will plug you in. Plan on releasing the poll Thursday Feb 28. State Tournament finals set to start at Wt Class 138 Saturday nite. Editor's note: I got this in an email from communications@nfhsnetwork.com Watch A, AA & AAA Live! WATCH LIVE HERE. If you click the link you are on your own. Due to the state wide teachers work stoppage/strike and school being cancelled in numerous school systems due to inclement weather the SSAC has approved base weight + 4 for all three days of this years state wrestling tournament. Revised document: 2019 Skin Checks and Weigh Ins. 2019 West Virginia State Wrestling Tournament: Updated skin check / weigh-in times. See memo regarding 2019 Skin Checks and Weigh Ins. Class AAA, Region 3 reversed the order of third/fourth in the originally submitted 182 results. The new order and records are: T3-Andrew Brown, Princeton, 20-17; F3-Seth Anderson, George Washington, fr., 18-18. This, of course, changes the brackets, which now reflect that. Class AA-A, Region 2 reversed the order of fifth/sixth in the originally submitted 106 results. The new order and records are: 5th: Andrew Bartlett, Roane County, fr., 31-17; 6th: Matthew Ables, South Harrison, fr., 16-14. This changes nothing in the brackets, but might be needed if there's a withdrawal in AA-A 106. Attention WV High School Coaches: We will plan on releasing the fifth 2018-19 WV HS Individual Weight Class Rankings on February 15. HS coaches can log in to vote/comment in the "High School Coaches Only" area of the forum by 6PM Thur Feb 14. You need a coach username/password to get in to this area of the forum. If you need a username/password to get in to this area, send email to tmiller@mountain.net and we will plug you in. January High School Scores updated. AA/A Region III entries and preseeds Note: Brackets will be drawn AFTER weigh-ins and Coaches meeting. January Middle School Scores updated. Attention WV High School Coaches: We will plan on releasing the fourth 2018-19 WV HS Individual Weight Class Rankings on February 8. HS coaches can log in to vote/comment in the "High School Coaches Only" area of the forum by 6PM Thur Feb 7. You need a coach username/password to get in to this area of the forum. If you need a username/password to get in to this area, send email to tmiller@mountain.net and we will plug you in. Plan on releasing the poll Friday 2/8/19. Attention WV High School Coaches: Vote in the seventh High School team poll by 6 PM Wednesday February 6. HS coaches can vote in the "High School Coaches Only" area of the forum. You need a coach username/password to get in to this area of the forum. If you need a username/password to get in to this area, send email to tmiller@mountain.net and we will plug you in. Plan on releasing the poll Thursday Feb 7. Info from the WVSSAC regarding Wrestling Regional Info & Forms and Wrestling State Info & Forms AT THIS LINK (scroll down to the bottom of the page). *** Magnolia JV Tournament is still on for tomorrow, February 2nd. Weigh ins are 8 - 9:30 and wrestlers will get base +4. Come get some quality mat time for your JV wrestlers one last time before Regionals and the end to most of these kids season for all the hard work they also put into our programs during the wrestling season. High School Academic All State and Academic Honor Roll updated. Also, Middle School Academic All State and Honor Roll updated. Attention WV High School Coaches: We will plan on releasing the third 2018-19 WV HS Individual Weight Class Rankings on Janauary 31. HS coaches can log in to vote/comment in the "High School Coaches Only" area of the forum. You need a coach username/password to get in to this area of the forum. If you need a username/password to get in to this area, send email to tmiller@mountain.net and we will plug you in. Plan on releasing the poll Thursday 1/31/19. The Parkersburg South, St Albans @ Ripley Tri has been moved to Thursday January 31. Attention WV Middle School Coaches: Vote in the third Middle School team poll. Vote by 6PM Wednesday January 23. MS coaches can vote in the "Middle School Coaches Only" area of the forum. You need a coach username/password to get in to this area of the forum. If you need a username/password to get in to this area, send email to tmiller@mountain.net and we will plug you in. Plan on releasing the poll Thursday Jan 24. Attention WV High School Coaches: Vote in the sixth High School team poll by 6 PM Wednesday January 23. HS coaches can vote in the "High School Coaches Only" area of the forum. You need a coach username/password to get in to this area of the forum. If you need a username/password to get in to this area, send email to tmiller@mountain.net and we will plug you in. Plan on releasing the poll Thursday Jan 24. December High School Scores updated. November -- December Middle School / Youth Scores updated. With the semester change, it is time to collect the names of honorees for the "WV-Mat Academic All-State and Academic Honor Roll recognition. We congratulate West Virginia High School and Middle School students who have demonstrated success in the classroom as well as on the wrestling mat. Wrestlers and members of the team support staff* with a GPA of 3.7 or better for the first semester/term of the current year or cumulative average are named to the WV-Mat Academic All-State team, High School or Middle School. Those with a GPA of 3.0 to 3.69 for the first semester/term of the current year or cumulative average are named to the WV-Mat Honor Roll. Coaches please submit names of honorees on your team via email to tmiller@mountain.net. All-State honorees will receive a certificate of recognition, postal mailed to the coach. No certificate is available for the Honor Roll recipients, but they will be recognized on the website as well. *Support staff includes team managers, statisticians, Mat Maids, student trainers, and other members of the team support staff. Attention WV High School Coaches: Vote in the fifth High School team poll by 6 PM TODAY January 9. HS coaches can vote in the "High School Coaches Only" area of the forum. You need a coach username/password to get in to this area of the forum. If you need a username/password to get in to this area, send email to tmiller@mountain.net and we will plug you in. Plan on releasing the poll Thursday 1/10/18. Regarding National Guard Duals this weekend in Summersville: Weight Allowance for the National Guard Duals will be base +3 Friday and base +4 Saturday. Attention WV High School Coaches: We will plan on releasing the first 2018-19 WV HS Individual Weight Class Rankings next week on the 9th or 10th (give or take). HS coaches can log in to/vote/comment in the "High School Coaches Only" area of the forum. You need a coach username/password to get in to this area of the forum. If you need a username/password to get in to this area, send email to tmiller@mountain.net and we will plug you in. Plan on releasing the poll Thursday 1/10/19 (give or take). Important memo from the West Virginia Youth Wrestling Association regarding the Safe Sports Act of 2017. Question received: How can scores that have been submitted be corrected? Answer: Just email me the correction. Attention WV Middle School Coaches: Vote in the second Middle School team poll. Vote by 6PM Thursday Dec 27. MS coaches can vote in the "Middle School Coaches Only" area of the forum. You need a coach username/password to get in to this area of the forum. If you need a username/password to get in to this area, send email to tmiller@mountain.net and we will plug you in. Plan on releasing the poll Friday 12/28/18. Attention WV High School Coaches: Vote in the fourth High School team poll by 6 PM Wednesday December 26. HS coaches can vote in the "High School Coaches Only" area of the forum. You need a coach username/password to get in to this area of the forum. If you need a username/password to get in to this area, send email to tmiller@mountain.net and we will plug you in. Plan on releasing the poll Thursday 12/27/18. Do you have an item of interest to post on the West Virginia wrestling Bulletin Board? The Sparrow's Spirit, by Dr. Bill Welker, Ed.D. Available on-line from the publishing company RoseDog Books through its online bookstore. January 17th – 18th, 2020 the Bear Den Brawl wrestling tournament will return to Union High School in Big Stone Gap, Va.
We have not held this tournament the past 2 years due to weather and football playoffs. This a very competitive tournament that give teams a chance to get matches in both a team and individual format. In the team to individual format, teams will wrestle round-robin duals and determine the pool winner (Fri-Sat). On Saturday, the winners of each pool will then crossover to wrestle and determine the team champion. On Saturday following completion of the duals, the top wrestlers from each weight class in each pool will wrestle for individual weight class championships. Individual medals will be given for placers as well as team trophies for 1st & 2nd place teams. Outstanding Wrestler Awards will also be presented. The goal is to get wrestlers as many matches as possible over the 2 days in a competitive team & individual environment. In the past we have had teams from the following states represented: VA, KY, SC, TN, WV, OH. 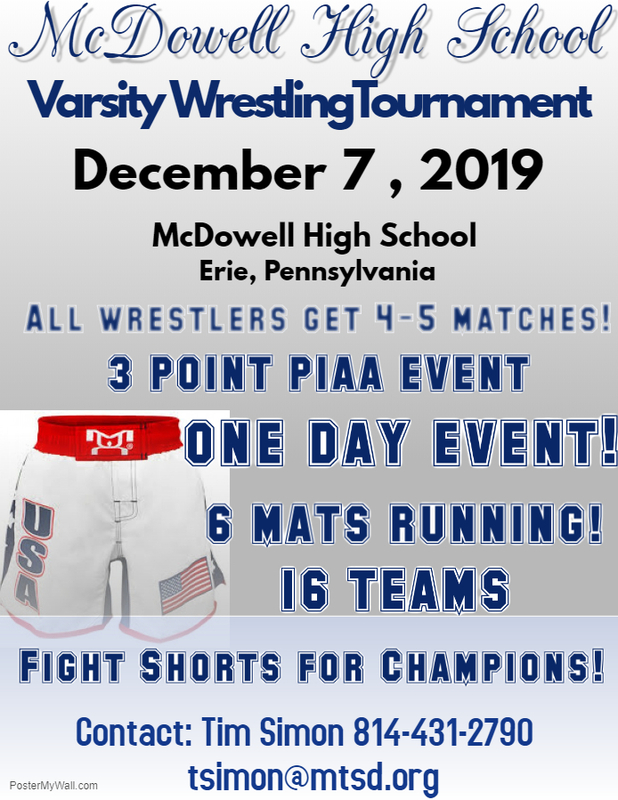 McDowell HS in Erie, PA hosts a 16 team individual tournament Dec 7, 2019. Kids are put in pools of 4, then separated into a semi and final based on their pool placement. All kids will get 5 matches. We also run JV matches all day for extras. We have some of the top teams in PA in this event and a few from Ohio. We would like to attract a team or two from the south. Both schools will be including our middle school programs as well. We would like to open the match up to 1-2 more teams (preferably that can bring middle schools as well). Please contact Head Coach Jay D. Smith at 304-966-6577 or jay.d.smith@k12.wv.us. Greetings coaches! As your season winds down and you start thinking about tournaments for your schedule for next season, we would like you to consider a two-day, ten team dual meet tournament that we are looking to host at Mountain Ridge High School on December 13th & 14th, 2019. MRHS is located in Frostburg, MD. We feel that Frostburg, which is in western Maryland (Allegany County), is in a great location to pull teams from many different areas. We are just a little more than two hours from the Baltimore/DC area, Pittsburgh, and Wheeling, WV, and we are about one hour from Morgantown, WV and Winchester, VA. Because of our location, there is potential for us to host a tournament with teams from four or five different states. This would allow teams to wrestle programs they don’t typically compete against. One draw for coaches to participate in a tournament at MRHS is our facilities. Mountain Ridge is a newer high school. We opened in 2007 and have outstanding athletic facilities. Another draw is that we have a staff that has a lot of experience in running tournaments. And since Frostburg is home to a university, there are plenty of hotels and restaurants in the area. We feel strongly that teams would not only find our tournament competitive, but it will also provide an enjoyable experience for coaches, wrestlers, and fans. If you are interested in attending, please contact me for more information. I can be reached at the cell number (text or call) or email address listed below. Thank you for your time. I hope to hear from you soon. Good luck with your post season competition(s). 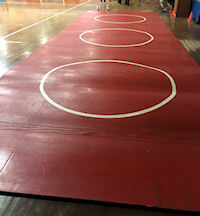 I have an older 38x38 Resilite mat (3 sections) for sale. The competition side isn’t in the greatest shape but the practice side appears to be decent. We like to sell for $1200 if you know anyone that may be interested. Located in Ansted, WV. Youth Wrestling Parents: There are rooms available at the Holiday Inn next to the Huntington Civic Arena. Rooms will be completely remodeled. ALL rooms have a sleeper sofa for 2019 to better accommodate groups! Plain red Dollamur Flexiroll mat 10x10 in 2 pieces. I have rubber underlayment as well to go with and 10 blue old school wall mats. I am located in Huntington, WV 304-617-3078. They need cleaned pretty good from storage. If anyone knows of someone who could use them just text call or email. Would be ideal for a young athlete to practice drills on. There are no markings on the mat. Our school district is adjacent to Jefferson County (WV) at Harpers Ferry. $800.00 can contact 304 288-9699. Located in Harrison county. BSN Sports -- we have a lot of table top scoreboards left in inventory. Iâ€™m offering them at a great deal see the details. Now accepting orders. I can make custom 1 foot trophies with the wrestling figurine on top for only $6.00 per trophy. No order to is too big or too small. We are dedicated to quality. Complete line of sports equipment, including wrestling gear. I would like to offer our services to your readers and the wrestling community at large. We are one of the largest scale providers in the east and as such can provide scale services to wrestling teams around the state. We can repair, service and calibrate most scales. In accordance with the WV Department of Labor, Weights and Measures Division, Brechbuhler Scales, Inc. and its scale technicians are registered, tested and certified to install, service, repair or recondition commercial weighing and measuring devices in the state of West Virginia and Ohio. If I can be of any help to you regarding wrestling scales, let me know. Information on these pages may be copied, reproduced, and used in any way which promotes, publicizes, or facilitates West Virginia High School Wrestling.